You know that if a restaurateur debuts by building an Asian fusion bistro out of 100-year old teahouses shipped from Vietnam, you're in for something special. The restaurateur in question is Mai Nguyen, who founded Sapa Sushi Bar & Grill (722 S. State, 801-363-7272) in 2009 as the beachhead for her ever-expanding culinary empire. The space is quite unlike any other downtown restaurant I've visited. One step over the threshold and the bustle of State Street seems to melt away, while you enter what feels like a different time and place. Vibrant crimson chandeliers taken from the Dale Chihuly sketchbook hang from the ceilings like cryogenically sealed fireballs; walls are crowned with intricately carved designs; and the dutiful sushi chefs behind the bar move like sharks who have just zeroed in on their prey. It's quite a bit to process when visiting for a quick lunch—my grumbling, sushi-craving stomach just wanted a fix, but my fantasy-saturated brain couldn't help but pretend I had stumbled onto a far-off temple from some forgotten dynasty. There's plenty here for the eye to savor and digest, but that's just a psycho-sensual appetizer. The menu is fully stocked with staples from all over Asia. I spotted a few curries, a full lineup of pho and let's not overlook their extensive selection of sushi rolls. In short, more than enough to satisfy the taste buds in the same way the décor eases the eyes. Judging from my experience, it's not a bad idea to shoot for an early meal. Sapa is a lunchtime juggernaut—its primo location, swanky atmosphere and copious amounts of sushi make it ideal for the business-lunch crowd, and the place gets absolutely packed shortly after noon. Lunch is also a great time to sample the non-sushi parts of the menu if raw fish isn't your thing. Dishes like massaman beef ($12) or short ribs ($13) arrive in thoughtfully packaged bento boxes, with each smaller box containing potstickers, a few California rolls and a flavorful salad with sesame dressing. The presentation of these ergonomically pleasing dishes is right at home with Sapa's interior design choices, and the food within perfectly complements it. Meals are fresh, beautiful and leave you pleasantly awestruck. Sapa's massaman is of the rich, stew-like variety, which pairs well with the thin slices of beef swimming around within. The short ribs are grilled to perfection and offer a minimalist alternative to the jacuzzi of flavors characteristic of the dish. As one of my visits to Sapa took place during an early autumn rainstorm, I couldn't pass up an opportunity to try some of their pho. Sapa's menu includes the real deal in all its tripey glory, but I've come to realize that I prefer my pho sans guts. Instead, I went with a small bowl of the steak and meatball pho ($10). I'm never going to eat enough pho to consider myself an expert—recipes are as diverse as the chefs who prepare this traditional noodle soup—but I'm confident in declaring that Sapa's iteration is pretty damned good. Its beef flavor profile is slightly lighter than other phos I've known, but that lightness makes it ideal for a lunchtime visit. Bottom line: It doesn't weigh you down, but it also doesn't leave you hungry, either. As far as sushi goes, the best way to experience the vast menu is to fast for a few days and go bonkers with Sapa's all-you-can-eat option ($28.95). It's a ritual that takes place Monday through Thursday from 5 to 6:30 p.m., but it's the only way you can experience true sushi enlightenment. 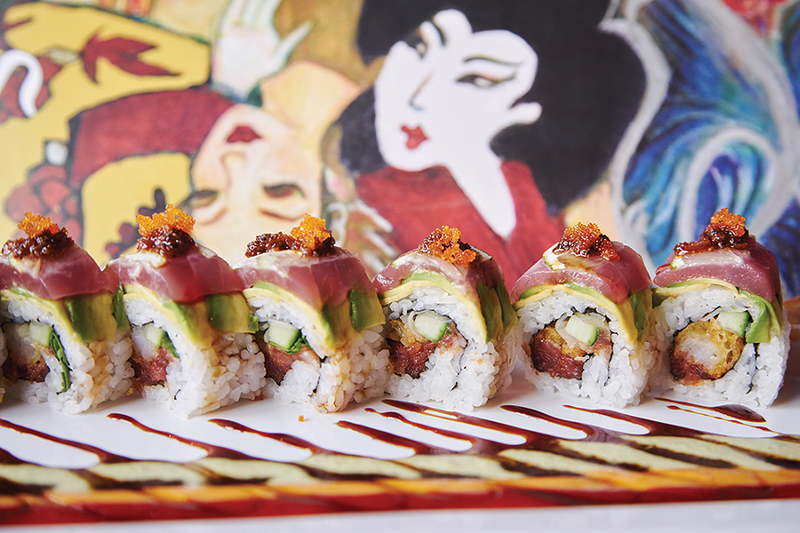 When you go, some standouts include the spicy yellowtail and the sunset roll. But maybe that's just because I'm a sucker for sushi rolls topped with paper-thin slices of lemon. There aren't many sushi places I'd recommend braving during lunchtime downtown, but Sapa's beautiful interior and equally beautiful take on Asian fusion are welcome distractions from stale, fluorescent-lit workdays.